A parking lot is one of the first things noticed by customers, clients, and visitors entering a facility. The color contrast of a newly striped lot is attractive and is a good indication that the property owner cares about all aspects of the customers experience. A well-marked parking lot with crosswalks, stop bars, loading-zone, and properly marked pickup areas easily directs people safely around the parking area. Informing customers where they should walk, when to give right-of-way to traffic, and what areas to avoid. To help preserve or improve the flow of traffic on a parking lot, Sealer King's parking lot stripers will either re-stripe or lay out new markings per customer's blueprints or our design. Increased Business – The bright contrast created by well maintained striping can attract the attention of new customers. Customer Satisfaction – Well maintained parking lot striping is a good indication to the customer that you are concerned with the maintenance of the lot. Face Lift – New striping can enhance the appearance of an older lot. Safety – A well-marked parking lot directs people safely around the parking lot. Maximize Space – Parking lot striping allows you to make the best use of the space, providing an easier work environment for store employees and a better experience for your customer. 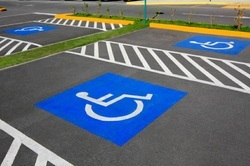 ADA Compliance – Parking lots will be striped according to your company’s specifications unless local ADA specifications differ. In these cases, the lot shall be striped according to local ADA standards. Signed into law in July 1990, the Americans with Disabilities Act (ADA) affects every property owner. Regardless of company size, all businesses must now have the proper amount of handicapped-accessible parking stalls, and required van parking spaces. Access to your property and compliance with regulations (Federal, state, and municipal) is an imperative for all facilities. ADA compliance through pavement markings and signage not only ensures avoiding fines and penalties but also allows easy access to your property. 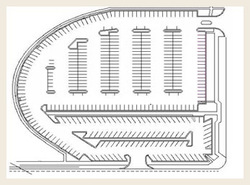 Providing the most stalls possible in a functional parking lot is the main goal of a layout. The straight-in design (90°) always allows for the most stalls; but, for a variety of reasons, angled stalls (45°, 60° or 75°) are preferred. Straight-in stalls are easiest to lay out and stripe, plus they permit two-way traffic. Angled stalls, on the other hand, are easier for drivers to turn into and back out of and require a narrower lane. In addition, angled stalls provide a controlled one-way traffic flow and create a herringbone design that many owners find appealing. Unfortunately, the greater the angle, the more space is taken up.